Sarasota Numismatics is pleased to offer numerous auction services for our clients. Sarasota Rare Coin Gallery attends all of the major auctions across the country. Our experience with these venues enables us to properly assist our clients in finding the right coin for their collection. With our state of the art want list function we are able to prepare customers ahead of the auction for possible additions. We can identify which coins to physically inspect, and then prepare before the auction begins, allowing time to strategize about goals and resources. This allows us to steer clear of “problem” coins that may look good in the catalog but fail under physical inspection. With a plan in place we will bid on your behalf to achieve your collecting goals. We pride ourselves on only selecting the finest rare coins for our clients, protecting them from problems later on. We are pleased to offer third party grading assistance for our clients. 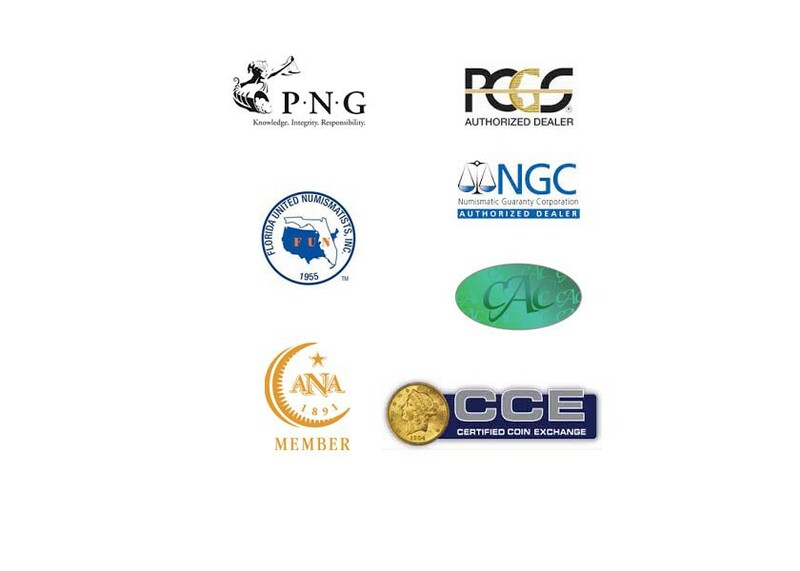 We can submit to PCGS, NGC, PMG and CAC on your behalf as well as assist in deciding what to grade from your collection. Sarasota Numismatics is pleased to review your coins and answer any questions you may have about conservation, regrading and crossovers. Our state of the art want list system is designed to help you find the right coins. Want list maintenance can be done right on our site or delivered to us for entry via email or at our showroom. Once entered, our system automatically will match inventory with your needs, so you will be the first to know about new purchases that meet your needs. Our buyers will be looking out for exactly what you want. Just sit back and relax while we do all the work for you. The online PCGS, NGC and PMG registry set competitions offer a fun and rewarding collecting option. We have built a number of finest and top rated sets for our clients. If you are not familiar with how these sets work please contact us. Many collectors have found competing on the registry to be a great addition to their hobby.